Shared this picture with my bestie. Man, we really miss those burger days! There was this one time during highschool when we decided to sell our own handmade crafts; pompom pencils, pompom keychains, and gift cards during hari koko. I think it's hari koko, can't really remember. We opened a booth under our class, 4 Murni. But truth is, it was a project of only the two of us. Haha. She stayed over at my house, sleptover. We spend the whole night in my pink bedroom making crafts. And when we got hungry in the middle of the night, me made burgers. I made her a burger, grilled on our electric griller, and we both enjoyed our burger in front of the tv, sitting on the floor. That was the FIRST and LAST time I made her a burger. And up til now, she kept on saying it was the best burger she ever had. 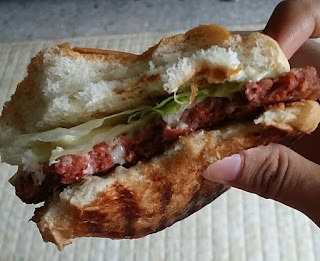 The burger was just like the one in the picture; daging nipis, cheese sekeping, roti burger apit atas bawah (can't remember got sayur or not). Sebenarnya it wasn't the burger. It is THE MOMENT that was the best ever. You can eat plain rice and still think it was the best meal you ever had. Just because you had it with your loved ones or maybe that was the very first nasi you succeeded cooking. Or because it is free. HAHA. Actually, while I was writing this, suddenly Sofia woke up. I was waiting for Subuh actually. Now that she's having a short nap in her hammock, I'm trying my best to get this post done. Oh anyway, Sofia woke up and I went to nurse her. While she was latching, she stopped a few times to look up at me and smiled. Aih... That cute, innocent smile... Made me think back again about what I just wrote. Yes I really miss those burger days. Carefree. Less resposibilities. Less things to worry. More me time... And of course, not having to worry if salah makan. Burger everyday also no problem. But hey, I got Sofia now. I wouldn't want to go back and not have Sofia. This little baby is so much of a blessings already. But I certainly wouldn't mind an outing with my bestie (without Sofia) one day. Bagusla kata-kata sya tu.. just flush it down.. heh.. Eh samalah! I pun everyday makan burger weh guilty lak rasa.. hahahah... ada juga tengok kat ig sya kut yang sya post pasal burger delivery tu. Sama macam kawan i! Penyabar sungguh makan satu-satu... I pulak yang geram kemain sopan je nampak..